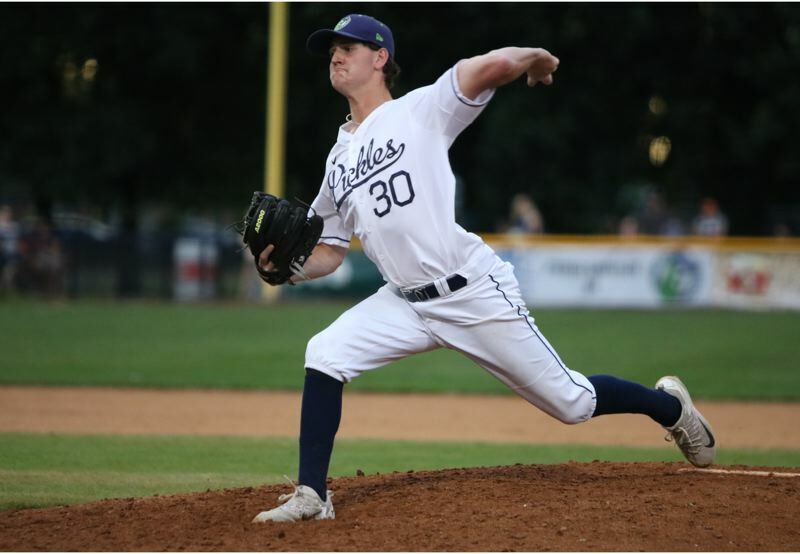 The Portland Pickles were locked in a scoreless tie with the Cowlitz Black Bears last Thursday night when left-hander Brad McVay came out of the Pickles bullpen, replacing starter Alex Roth. McVay was overpowering in his three innings. He surrendered an infield single leading off the fifth, but that runner was thrown out on an attempted steal, so McVay's final pitching line showed no runs on one hit with three strikeouts while facing the minimum nine batters. Cowlitz broke through for three runs in the eighth and four more in the ninth and walked away with a 7-1 road win in the final game of the three-game West Coast League series at Walker Stadium. The decision snapped Portland's six-game win streak on a night when one of the few Pickles highlights was provided by McVay, the former Milwaukie High ace who is enjoying a breakout summer baseball season after struggling in his first season at the University of Portland. McVay is 4-0 with a sparkling 0.39 ERA for the Pickles and has thrown a total of 23 innings, allowing one run on six hits with seven walks and 29 strikeouts. Those numbers are striking compared to ones he put up for the Pilots as a freshman last spring, when he made four appearances and threw only two innings, allowing four runs (two earned) on four hits with two walks and two strikeouts. So, what's happening this summer with the Pickles that wasn't happening in the spring with the Pilots? "I think it's a confidence thing," McVay says. "Getting up on the mound for UP, I was always a little bit nervous. It was my freshman year, I was trying to prove myself, and I got a little too amped up and messed things up a little bit. "Now, I'm just feeling free and comfortable, so that helps. I'm getting back to throwing a lot of strikes, I feel I can throw my change-up whenever and wherever, and I'm just locating all my pitches, which has been a big thing. "And, again, I'm feeling comfortable and throwing with a lot of confidence." The Pickles are in their third year and first a member of the West Coast League, one of the premiere summer collegiate wood-bat leagues west of the Mississippi. Through the first 26 games, Portland had used 23 pitchers — yes, 23 — utilizing a "piggy-back" rotation in which one starting pitcher works the first three or four innings, a second starting pitcher works the next three or four innings, and then the back end of the bullpen mops up an inning or two at a time after that. As a result, almost everyone on the staff sees regular action and nobody is in danger of getting overworked. "The system has worked great," Pickles pitching coach Zach Miller says. "Some guys might have an ego and be like, 'No, I want to go my six or seven innings.' Well, they're on loan to us in the summertime and we've got to send them back healthy and ready to win a job in the fall. "We're not going to run guys out to get 65 innings. They're going to be around the 30- to 40-inning mark, and the guys we're grooming as closers and back-end bullpen guys will get their 15 to 20 innings, and hopefully they all progress." McVay is among the team leaders in most of the significant pitching categories, tied for the team lead in wins (4), tied for second in strikeouts (29), and first in ERA among regular pitchers. "I didn't have the season that my coaches or I wanted at UP, at all, so the goal this summer was to get better all around," McVay says. "My goals are to gain some weight, lift a lot more weights and try to get my command down. "I'm throwing decent. It could be a little better here and there, but the atmosphere for the Pickles is so fun. It's competitive ball, the fans are great, and the team chemistry is unbelievable for a summer ball team. It's just a fun time." Miller and UP pitching coach Connor Lambert were college teammates at Washington State at one time, so Miller knows what the Pilots would like to see McVay accomplish this summer with the Pickles. "A lot of it is just getting Brad to trust that he's a great left-handed arm and can throw his stuff in any count," Miller says. "He's got a good, live fastball, but can we build off it with a change-up? "We've been throwing a ton of change-ups. I'm guessing about 45 percent of his strikeouts have been off change-ups. It's a good pitch for him. He gets guys off balance with it, and it sets the tone for his fastball." Miller also has seen McVay make significant strides with his slider — a breaking ball that is another complementary pitch to set up the fastball. "The slider was almost non-existent, but that was one of the things Lambert said we needed to get working before the start of fall ball," Miller says. "So, we've been putting in work during Brad's bullpen sessions on throwing the slider with confidence. And when he throws three pitches for strikes, it makes him a tough, tough arm to face from the left side. "This summer is more on him believing he can do that. I just think he wasn't able to have that success last spring and he got bogged down at UP, being it was his freshman year, and I think he's going to go back and turn some heads with how he's grown." The Pilots graduated seven seniors, including starting pitchers Camden Mueller and Corbin Powers, and Miller says he envisions McVay competing for a spot in the UP rotation next season. "I think he can go in next fall and say, 'Hey, I could be a Sunday guy,'" Miller says. "Being a left-hander in the West Coast Conference, I don't know that he's going to be a Friday night arm for the Pilots, but a lot of times your best starters are late-series guys, anyways. "If you can't win on a Friday night on the road, you're looking for those back-end guys to get you wins. So, I think he's got the confidence piece down and the work ethic. He's just a good kid to be around. I mean, he's here to work and everyone can see that, so I can see him doing some big things." McVay made one start for the Pilots last spring against Cal State-Bakersfield, but got lifted in the second inning after the first three batters reached base. The season went downhill for McVay after that. "I didn't come through with what they wanted or what I wanted, especially," he says. "You can keep working, and I did get a couple more appearances which also didn't go the way I wanted. It's a high level of ball, and once you get your opportunity, you need to nail it. "I know what I'm capable of, and it's frustrating when that doesn't get shown out on the mound, but I understood what was at stake and I just needed to keep working." McVay's stick-to-itiveness has paid dividends for the Pickles, but it remains to be seen what that translates into with the Pilots. Will he become a full-time starter? A spot starter? A middle reliever? A mop-up guy? "I'm not sure exactly what my role will be, but I hope to be a big part of the staff and help the team," McVay says. "That's all I'm looking for, really. Anthing that gets me innings, anything that helps the team, honestly. "I think this summer has helped a lot, getting some innings and getting comfortable on the mound again. If I stay consistent, I'll definitely bring it back into next season for Portland."